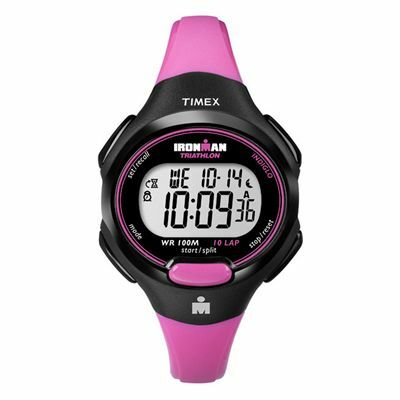 The Timex Ironman Traditional 10 lap ladies’ watch is water resistant up to 100m and perfect for any sports enthusiast. It features a clear white reflector LCD display with the Indiglo® Night Light system and a night mode feature allowing you to read it in a variety of conditions. The 100 hour chronograph shows lap and split times and the time countdown is 24 hours. The watch counts laps up to 99 and has a useful 10 lap memory recall. It also displays date and time in 2 time zones. The neat rubber strap has a buckle clasp and is comfortable to wear. for submitting product review about Timex Ironman Traditional 10 Lap Ladies Watch.